Warwick & District Carriage Driving Club held its first CDE for 2013 at the Dillmann’s property ‘Strongfield Stud’, Southbrook. To say that the Dillmann’s put in a huge effort to get their place ready for their first CDE is an understatement. Eugen Dillmann has a grand plan in mind for his property. The month leading up to the CDE was frantic and most days were a height of activity. Besides the dedicated efforts of Eugen, Karyn and Kurt Dillmann, the enthusiastic support of many others helped lighten their load. Special mention must be made of these wonderful people. Dear friend of the Warwick Club and the Dillmann’s, Tracie Borg, travelled down from Clermont with her daughter Chloe, and camped at the property weeks before the event. Tracie’s sister Debbie and her husband Ray also put in countless hours helping Eugen. Tracie’s husband Michael also came down to Southbrook closer to the event and offered his assistance. Last, but certainly not least, was the huge effort of Tamar Smith. She just about lived at the Dillmann’s; she spent many hours preparing and getting fit a number of horses for the event. I have a suspicion that she is quite over painting at the moment, as she did plenty of it. Four of the Five MO’s were purpose built and they are quality obstacles. My favourite is the Elders Real Estate MO. It is painted red and white, the Elders' colours. Elders Real Estate was the major sponsor of the event, and this obstacle is top notch. It would be pertinent here to mention Karyn Dillmann and the massive effort and success she had in gaining sponsorship for this event. Apart from Elders Real Estate, big contributors were Westside Timbers, Planet Paints, and Calveston Performance Ponies. Quite a number of Warwick members recently attended a school at Caboolture to become CDE officials. Four members are now accredited as Technical Delegates (TD), Marathon and Cones course designers, and Cones judges. The TD for this event was David Rozynski, the Cones judge, Karyn Dillmann, both from the Warwick club, and the Dressage judges were Lex and Jan Young, from the Range club. Saturday morning saw the dressage and cones being judged. What a magnificent sight it was seeing so many beautifully turned out horses, ponies and carriages! As well as Warwick members in attendance, other clubs represented were Townsville, Cooloola, Valley’s & Rim, and the Range club. Bronwyn McAdam was in attendance, fresh back from her trip down south where she won both the Moonbi and National Combined Driving Championships at Witwood. Her pony, Whisky, is now graded open, and this was her first event competing in open class. 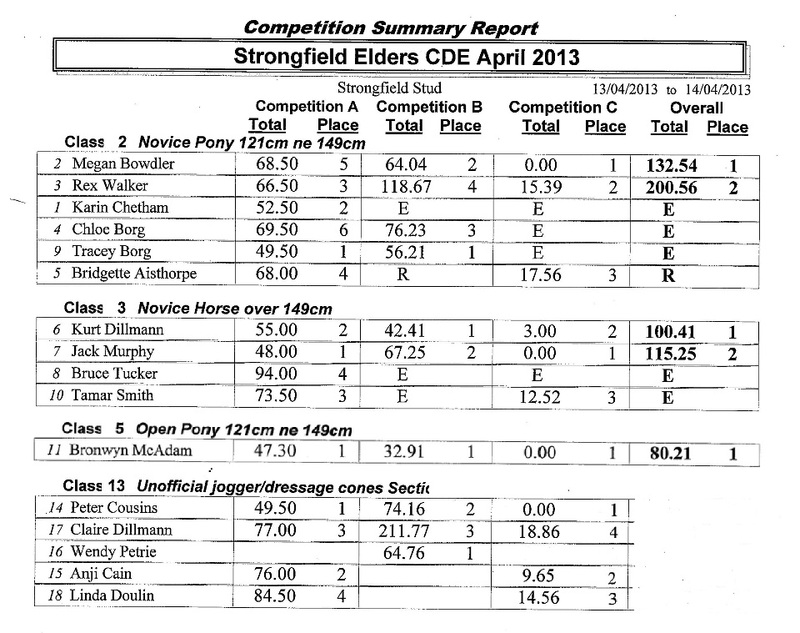 The two biggest classes were Novice Horse and Novice Pony. 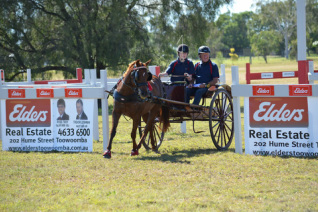 The Novice Pony class had three junior drivers, Chloe Borg from Clermont, Bridgette Aisthorpe from Roma, and Megan Bowdler from Toowoomba. All acquitted themselves very well. It was also great to see Rex Walker back in competition carriage driving. It’s been a long time since Rex has been able to compete and I’m sure that he got a buzz out of being a foundation competitor at Strongfield. The weather wasn’t so great on Saturday morning. Wind and drizzle came across making things a little difficult. The 19th obstacle in the cones course also caused a few headaches, with some competitors driving it backwards or missing it. These little hiccups make a stronger and better driver and competitor. Sunday was Marathon day and as already mentioned, the MO’s were spectacular, and the drivers couldn’t wait to get to them. The Elders Real Estate obstacle went to F, two obstacles went to E, and two obstacles went to D. All obstacles had many options, both short and long, to suit the ability and training of each of the combinations. Eugen Dillmann was fortunate enough to groom for Bronwyn McAdam, and found it a real eye opener. Bronwyn has the ability to take the short options, and to do it fast. Another creditable marathon performance was put in by Jack Murphy. This time driving Iris, Jack was able to get the very best out of this mare. The presentation after the event was marvellous with many people speaking in admiration of the work, effort and achievement of the Dillmann’s in hosting the first CDE at their property. Jan Young told the crowd that Combined Driving in Queensland is entering an exciting phase, and I couldn’t agree more. A memento of the event, a mug printed with the Warwick club logo and the photo of David Rozynski and Molly (the photo on the home page of the Warwick club website), was presented to each competitor as a keepsake. Let me finish by once again thanking the Dillmann family for their huge efforts in time, money and personal sacrifice to have Strongfield ready for this event. They have moved Combined Driving a huge step forward in Queensland. Let’s get behind them and help continue the momentum. Please take time to browse the scores and the many wonderful photos credited to Melanie Dillmann. Dressage photos of all competitors available here. Cones photos of all competitors available here. Marathon photos of all competitors available here.